We offer an unrivalled service with it comes to operating and maintaining energy centres. We manage over 110 plant rooms and energy centres across the UK. Correct operation and maintenance is essential to ensure the district heating network can continue to deliver heat and hot water for its full lifespan. Quality control systems are vital to ensure leaks and bursts do not happen and minimise disruption to end users. As standard we maintain each energy centre in accordance with the Standard Maintenance Specification for Building Services (SFG20) published by the Heating, Ventilation and Contractors Association (HVCA), and in line with all relative legislative requirements. We are proud to manage our energy centres in line with The Heat Networks: Code of Practice for the UK (CP1), which has been produced as a joint project between Chartered Institution of Building Services Engineers (CIBSE) and the Association for Decentralised Energy (ADE). 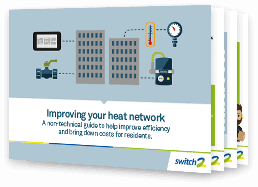 It provides a blueprint for excellence in heat network development and management. We have a robust process in place when we take on an energy centre which ensures the required due diligence in carried out and setup is in place and compliant. Switch2 has an experienced, dedicated commercial engineering team who provide 24/7/365 support to our schemes where we manage the energy centres. The team is led by a senior engineer with many years’ commercial experience and is on the BSRIA HIU steering group, a member of CIBSE, CIPHE, Engineering Council and a Fellow of IDHEE. Switch2 is accredited by The Safe Contractor Award Scheme.